When Eldad and Audrey Hagar first found Fiona last year in south Los Angeles, shivering and blind in a heap of trash, they couldn’t have imagined a happy outcome. Fiona when she was found cowering in a garbage pile in Los Angeles. Determined to help Fiona, Eldad and Audrey weren’t going to give up. 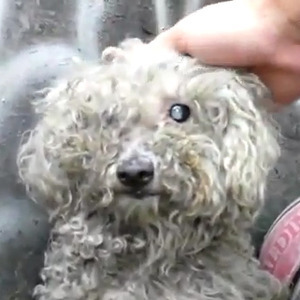 They picked her up from the trash she was lying in, shaved off her matted fur, bathed her to rid her body of the worst flea infestation they’d ever seen, and, with a lot of TLC, the kind pair nursed Fiona back to health. Today, thanks to the fundraising efforts of the Hagars and their animal rescue organization, Hope for Paws, Fiona was able to receive the surgery she needed to see again. The $4,000 eye surgery repaired the lens in one of Fiona’s eyes, allowing her to regain partial vision. The other eye, unfortunately, was too badly damaged due to severe glaucoma. Since her surgery, Fiona has been adopted and is doing great in her new home, which includes three other dogs. A YouTube video (see below) of Fiona’s miraculous transformation is lighting up the Internet, and the Hagars are pleased that her story is inspiring people around the world. The book Our Lives Have Gone to the Dogs, by Elad and Audrey Hagar, chronicles similar stories of animal rescue and human compassion.